Security up and electricity costs down! That about sums up this fix. 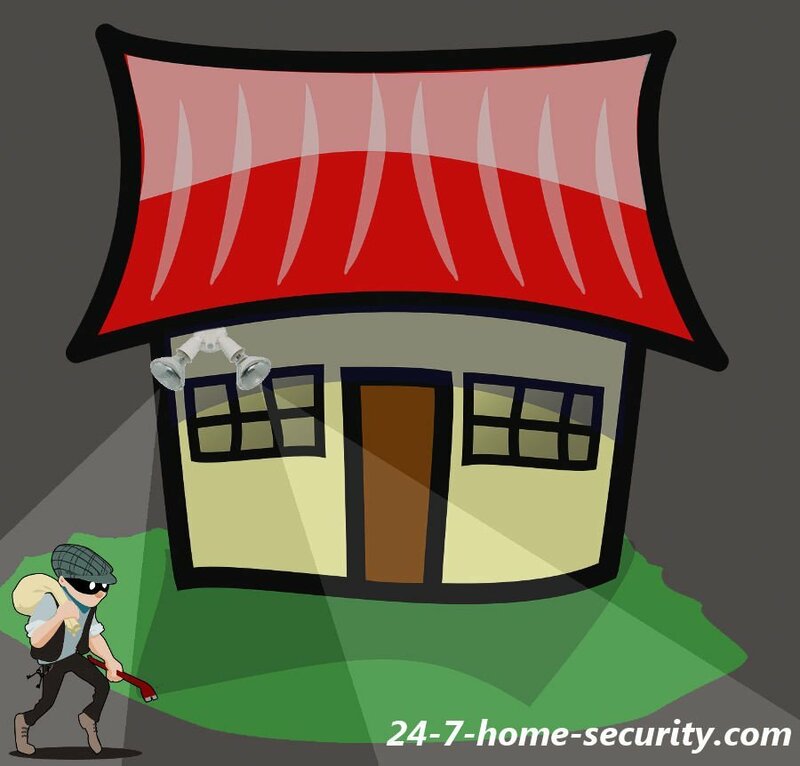 When analyzing the most effective burglary deterrents, we recently referenced a research paper based on a survey of convicted burglars in which 24% said outdoor lighting was part of their risk assessment before deciding to break into a house. For me, I’m going to stack any weight onto the “don’t break in” side of that decision that I can, especially if it’s cost effective. Many people don’t leave their outdoor lights on, defeating their benefits as a burglar deterrent. Listen, I’m sensitive to light pollution (who doesn’t like seeing stars at night) and wasting electricity too. But, you don’t have to compromise your safety by leaving the lights off all the time. Instead, just install motion detection lights. And if you already have lights, this guide to retrofit a motion light is just for you. Update: Since I wrote this, there’s now a super-easy alternative that requires no wiring from a company called Sengled that combines an LED bulb with a built-in motion sensor! Check it out the easier alternative on Amazon. They’ve also done lightbulb/speaker and lightbulb/camera mashups, so you know they’re not just a one-hit wonder. Why not just use standard flood lights? We already mentioned the environment and costs, but there is a security impact too. When lights are constantly on, you and your neighbors get used to them, like somebody living in LA thinks brown air is normal. They see it every day. If, on the other hand, a light comes on suddenly and there’s a creep in a hoody there, that is much more likely to get your attention. And, I would think it makes burglars uncomfortable too. Imagine sneaking around a house when a light snaps on. Immediately, you’re worried about if you’ve been spotted by someone inside until you find the source of the light (if it has an obvious motion sensor on it). Any time you make a would-be criminal think about getting caught before committing the crime, there’s an opportunity to avoid it altogether. Another benefit is that motion lights also save on your electricity costs. Instead of burning 8 hours a day, a motion sensor that is only active in low light conditions may only have your lights on for 30 minutes. With an incandescent flood light, that could lower your yearly electricity cost from $35 to a little over $2 assuming a $0.12/kWh cost. The pay off period (the kit we picked is $18) is about a year at that rate if you already have flood lights. After a year, the continued savings are just gravy on the top. Hopefully, you’re sold. So, let’s jump into fixing your lights. Tough one, right? Your kit should come with wiring nuts to connect everything together. Not Interested in Doing Your Own Wiring and Electricity? You can also pick up a screw in motion sensor switch that will fit many light fixtures. 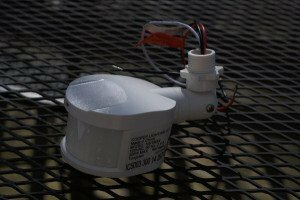 Pick up an outdoor motion detection kit online (make sure your existing light or box has a knockout to screw it into, otherwise pick up one of the screw in units linked above and the installation is super easy). Wait two days for it to show up. Remove the insert where you want to install the motion detector. 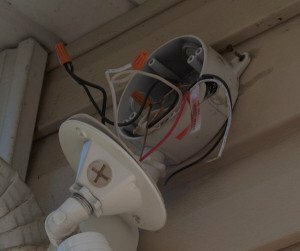 Run the wires into the fixture and screw the motion detector into your light fixture. Connect the hot wire from the house to the motion detector black, the red wire to the hot wire (black in the US) of the light, and tie the neutral wires together. 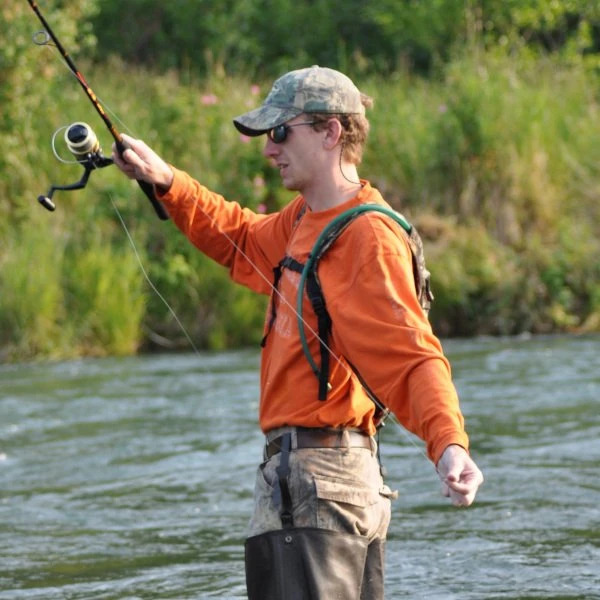 Adjust the sensitivity as needed, button it all up, and call it done. That wasn’t so bad, right? Now, all you have to do is wait for it to get dark so that you can test out the sensitivity of your new motion light! The only other thing you may want to do is check out the possible settings for the motion detector that might fit your situation better. For the unit that I picked up, you could set it to stay on for 6 hours after dusk or always turn on with motion (day or night) in addition to the standard low light only operation. Fortunately, most of you won’t have to worry with that step since the default operation is to only turn on when it’s dark and motion is sensed. Find this helpful? Say thanks by sharing it with your circle. If you need any help at all, just drop a line in the comments, and I’ll do my best to help you out. I’m not an electrician though, so please consult one if in doubt. Will this work on non-flood outdoor lighting. Standard box type wall fixture and screw in 60 watt bulb? 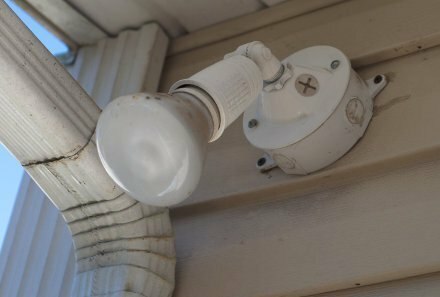 As long as you’ve got the knockout on the fixture to attach the threaded motion sensor to with a proper seal, it should be a piece of cake. If you have a decorative fixture, you may not have the knockout. If that’s the case, you would have to come up with another waterproof way to mount the motion sensor and wire it in with the light. Great article. You bring up multiple points that are worth considering. The benefits of scaring would be burglars and also saving money are enough to make me want to make the switch. Thanks so much for posting! I am only interest in the screw in motion sensor switch. I have four (4) flood lights at the rear yard wall of the house in a row and two (2) along the front yard wall facing the street over the garage door. 1. Where do I get these items to buy, I need them immediately as I will be away for few days next week? 2. Will I need six screw in motion sensor switches or sockets? Additionally do they come with instructions? 3. Please submit the mfr. name and Sk#,s. You will need one for each light that you want to be motion controlled. I linked to the screw-in sensors on Amazon in the article so you can check out the details and read reviews there. If u have 2 porch lights on the same indoor switch how do the motion light without leaving the other porch light on all the time? 1) The easiest thing to do would be to install a motion sensor on both lights and use the switch to override the lights when you don’t want them on at night. 2) If the hot (line) wire of the second light is fed from the box of the first light (most likely), then you could configure the motion sensor to switch both lights as long as you don’t exceed the current rating of the sensor you buy. Of course, you need to be OK with motion under one light controlling the other light as well, and you’ll need to verify your wiring to make sure that’s workable without major rewiring. 3) If both switches get independent runs of wire, then you would have to use option 1 or pull a third wire to deliver a switched line to the second light for option 2. Great directions!–Thank you very much. I do have a question, however: I have four decorative lamps along a very long TWISTED porch, controlled by one switch inside the house. I installed a HeathZenith motion sensor converter on the first lamp located next to front door. As I step out of the front door, all four lights come on–Just great! The problem I have is when I come home at night; I have to walk in the dark until I pass a turn in the porch for the sensor in the first lamp to “detect me”; thus, turning the all lights on. Now the big question: If I install a second HeathZenith motion sensor on the last lamp (the one farthest from the front door, behind the porch turn), will it activate all four lamps just as the sensor next to the front door does? I will appreciate your guidance on this issue. I am unsure about using a motion detector on each end of the “string” to light all, but I can offer an alternative. More than a year ago, I bought a battery-operated LED motion light to light my shop porch and steps when I leave the shop after dark. There’s a motion light on the house end (50 ft away) , so if I’m going to the shop, I am lit, so to speak. There’s enough distance that has to be traversed coming back to the house that needed a motion light before I reached the house motion light zone. It holds 3 or four D cell alkaline batteries and is a low wattage led light that is not more than five inches around, so it is fairly obscure in a decorative setting. It seals up nicely against weather, but I also have it under the edge of the shop porch roof. I have it come on a few times a week, mostly early in the morning before there’s enough daylight to see well and sometimes in the evening if I stay in the shop past dark. Since it is low wattage led, I’m still on the same batteries a year later. Cost about $20 (from Amazing) and provides great safety for shop porch and steps. Not really bright enough to be good security, but it gets me to the other zone where the brighter lights kick on. Thanks for the tip, Dennis. A solar powered unit may do in a pinch as well with a remote building like that. What can I do if my flood light does not have an extra knockout exit for the motion sensor switch? You could give one of the bulbs that have a motion sensor built into them a shot (check out the link in the article). Otherwise, you would have to remount your existing light on a new box with a knockout or get a new light. The best path really depends on how much time and money you want to put into a flood light. @jose. If your willing to run a wire along the awning ( or anywhere your comfy with.) you could split your controls into two and run same set of “control wires” to both sensors. That would let either control all 4. Similar to how switches at either end of a large room each can control the same lights. My floodlights are currently hooked up to a 4 way switch system. If the sensor is installed as suggested, is it possible to turn on the floodlights from indoors, from any of the 4 way switches, if needed, for some reason. You’re right, the sensor is in series with the light and is acting as a switch to power the light in my setup. To operate as designed, power to the sensor/light combo would be on all the time. You could wire the sensor in parallel with the switches to turn the light on either with the switch or the sensor (extra wire needed). To do that successfully, you would need to know which switch the line comes in on and bypass from there to the light with the motion sensor. You are essentially running another hot line to the light and utilizing the existing return. If the 2 switches operate independently, and the 4 way switch is turned on, when the sensor is also on, does that cause a surge in amperage to the lights with negative impact. For a given supply voltage (120 VAC in the US), a particular light will draw a fixed amount. By bypassing your 4 way setup, you are just finding another way to supply 120 VAC to the light. Having that source from two places does not increase the voltage at the light. So, the current draw by the light will be the same. In the event of a short in your light, the current will still be limited by the size of the breaker on the circuit. Many thanks for the clarification…….. I believe that lots of DIY’s need to be aware of this approach. Will a motion detector work with LED flood lights? The motion detector just acts as a switch controlling power to your bulb. So, the type of bulb doesn’t make a difference. Thank you very much for the insightful info! Have a question on the wire connections. In step 6, the recommended wire connections are: house hot line (Black) to sensor Black, house Red to light Black, all 3 neutrals are together. How the sensor Red and light Red are connected? Should the two Reds be connected or should be left unconnected? Thanks again. The red wire I was referring to in #6 is from the motion sensor. I only had white and black running to my light before installing the motion sensor. You are just 1) taking the two wires supplying power and the return to your light and 2) hooking those up to the motion sensor switch white & black. Then, the switched output from the motion sensor (red) supplies power to your light along with the return/neutral from the wall. Thanks for the quick response! I’ll try it later. I want to connect my porch light which is controlled from indoors. How can I install a motion detector but still control the light to turn on when I choose to with out leaving the sensor on all the time which defeats the purpose of a sensor! Thank you for the article very informative. I think you’re after the same thing as webweaver in his comment. The easiest method is to get a motion sensor with an override to let you flip it off and then on to force the light on. But, this may have the problem of going off after an extended period of time depending on your motion sensor. You could also hook your switch across the motion sensor to essentially bypass the motion sensor when you wanted to. So power would run to your switch and the sensor first (in parallel) and then the switched power would go to your light. Or, you could flip the whole thing and have the switch on the return side. But then again, I’m not an electrician, so better consult with somebody who is if you’re not sure! I have a motion sensor on the back of my detached garage with basement storage. Inside there’s a switch to turn them off. The problem is that one of the lights stays on all night and the other stays on all day. I just bought the place and can’t figure it out. What could cause this? It’s hard to say for sure, but it sounds like the motion sensor may have a built-in light sensor so that it doesn’t turn on in the day time. Combined with a botch wiring job that starves one branch of voltage while the other branch is active, you would get a situation like you describe. You may have to start disconnecting things and testing with a multimeter to figure out exactly what’s been done if you can’t access the wiring. Addressing the LED light question – you’ll want to verify what the minimum wattage draw required is for the sensor to function. I replaced two 75W spots with two LED 9W par38 and it would not work. It turned out that the motion detector required a minimum of 30W draw to activate the switch. Thanks for the tip, Dan. I would think the new motion sensors take that into account given the popularity of cheap LED bulbs now. I’m not sure exactly what you have from what you said. Did you remove and existing, working light and replace it with a motion-sensitive light? In that case, it should have just been a matter of taking the two wires from the old light out of the circuit and adding the new ones in place of the old. I have an outside light that was always motion sensored until I took out the light to hook up Christmas lights since I don’t have an outside outlet. Ever since I put the light back in after the holiday season, the motion sensor won’t work. 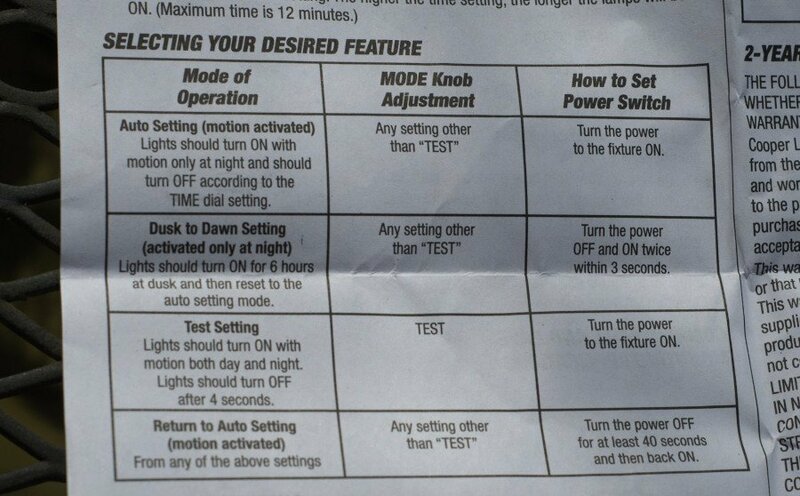 There are two switches…one for sensitivity which has high, medium, low…and the another switch for dusk to dawn. Any way you know how to make it motion sensored again? My guess is that you may have given it enough of a jolt when removing and re-installing it to cause some marginal component like a relay to fail. If you’ve already gone through all of the switch settings with no luck, it may be quicker to just order a replacement. Sorry! I would like 210 degrees of motion detection. Since there isn’t a motion detector that I know of that gives that coverage could two motion detectors be attached to one light? If so would you please give a description of the wiring. Well, I haven’t ever tried it myself, so your mileage may vary. But, if you hook both of the detectors to power (in parallel) and tie the switched output (usually red) together and run it to your light, the light should come on when either motion detector is triggered. I would like to put a couple motion sensors on my 300 watt landscape lighting transformer. What would be the best way to do this? You should be able to wire them up on the input side of the transformer just like you would a light. Just make sure your transformer doesn’t exceed the load rating of the switch. 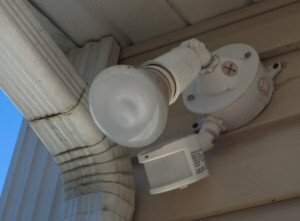 Can motion sensor lights be added to exterior recessed lights? Can motion sensor lights be added to a decorative exterior ceiling lights that has 4 bulbs? Sure, you would just have to mount the sensor with a good field of view of the area you want to cover. You could install a box above the soffet and screw the sensor into it instead of the light to control power. The fabricated electrical boxes have circles that are made to pop out and accept threaded conduit runs. Most sensors will cover 120-140 degrees at varying ranges. If you have to have wide coverage, you could hook two sensors in parallel to cover different areas. At my former house, I converted my outdoor light to a motion sensor just by screwing something in before I screwed in a light bulb. I don’t remember what this thing was. 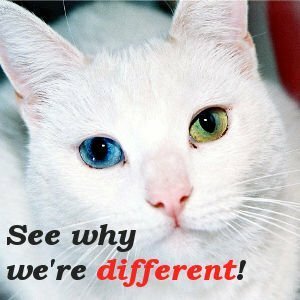 Can you tell me? 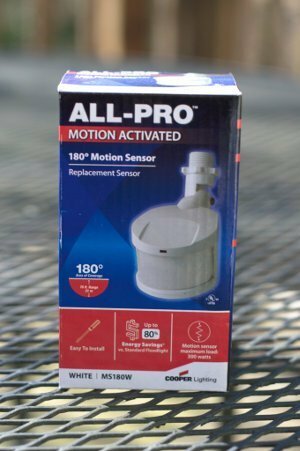 Something like this unit that lets you mount the motion sensor away from the light? the sensor is in a pole lamp. The old one is light sensor I need a motion type. Hi Wesley, what I would do is buy an electrical box that’s threaded or has knockouts that you need (practically all of them do) and then mount it above the ceiling of your porch with a hole below to pass through and screw in the motion sensor. If you plan your hole well, you have the advantage of mounting the sensor in a good spot and keeping the installation nice and neat. The only other thing you’ll need if you don’t have it already is a bit of 14 gauge, two conductor wire to run to the remote box. Sure, you can add a photosensor into the circuit pretty easily. I plan to just drill a hole in the housing some place where there is space enough to do no damage and permit the wires and the intruding fixture (mounting screw-in) of the motion detector to reach wherever they need. What isle your old light has 2 sets of the same wires? 2 greens, 2 whites and 2 blacks. It sounds like you may have another device (light?) connected to the same switch as the one you’re looking at. Can I replace my day night switch with a motion sensor switch ? Sure, and many of the motion sensor switches will have a photosensor built it so that they aren’t triggered all day too. I have two quartz halogen lights mounted on my house that are operated by one switch. Can I replace the two halogens with motion detector lights and eliminate the switch? Will the two motion lights work together without the switch or will I have to send both motion lights to power separately ? You will have to send power to both lights and use the motion sensors to switch them on and off.